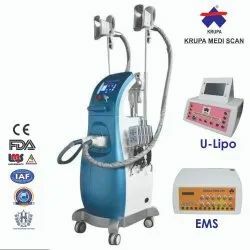 Pioneers in the industry, we offer slimming equipment, tripolar rf ultrasonic cavitation vacuum slimming system, lipo laser machine, liposuction machine and i lipo machine from India. Having a splendid vision on today’s health criteria, most of the people are getting conscious about their weight issue. To minimize their stress, we present a range of quality Slimming Equipment that fulfill all the criteria of reducing fat by compressing them to cell space and then permeate it into the lymph system. Reduces fat in thighs, hips, stomach, back, arms, chin etc. Tripolar Rf Ultrasonic Cavitation Vacuum Slimming system offered comes supported byRF, LED, vacuum and auto message support and finds suitability for use on all skin types. The system is built on selectively targeting of fatty tissue so as to achieve deep fat dissolve and reduction, skin tightening and body shaping. Other than this, the use of the process also helps in achieving improved skin elasticity. Some of its features include a large colour touch screen for convenient operations, allows for quick slimming effect, supports demands of body shaping and fat reduction among others. 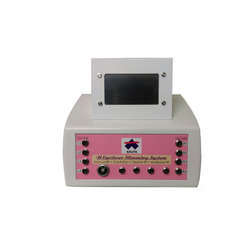 We are leading manufacturer and supplier of Lipo Laser Machine and we mainly interested to deal of this Lipo Laser Machine in Gujarat, Mumbai and Rajasthan. Painless and non surgical way to remove fat and cellulite. We are leading manufacturer and supplier of Liposuction Machine and we looking buyer of Liposuction Machine from all over India. We are leading manufacturer and supplier of I Lipo Machine and we are looking buyer of I lipo Machine from all over India, Mainly we want more buyer of I lipo Machine From Gujarat, Mumbai and Rajasthan.